Now that kids are back to school, maybe you need the occasional sweet treat to send in your child's lunchbox. When I was a kid, we used to get Little Debbie snacks every once in a while and one of my favorites were Oatmeal Cream Pies. 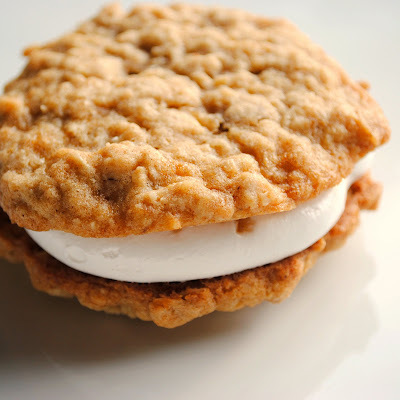 The soft oatmeal cookie sandwiching marshmallow cream filling was such a great combination. However, these days if I'm going to eat baked goods, I dont want them in a cellophane package from the grocery store. As I mentioned in my last post, I've been loving this marshmallow frosting lately so knowing I would have some leftover, I baked a batch of soft, chewy oatmeal cookies and decided to make some homemade oatmeal cream pies to send with my husband for his company picnic. 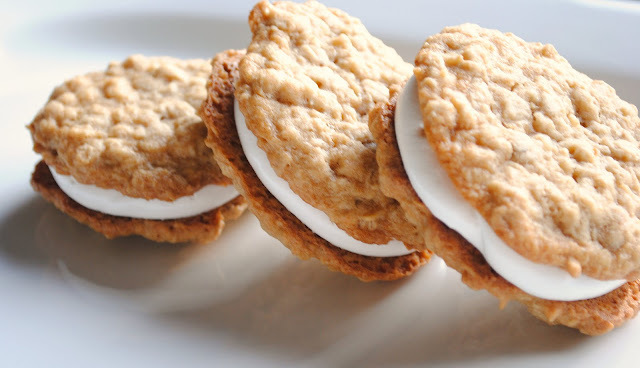 I would recommend using a cookie scoop or some form of uniform measure to drop the cookies onto the sheet so that you end up with cookies that match up fairly well for even sandwiches. Use a cookie scoop or similar measure to drop onto prepared cookie sheets and bake for approximately 8 to 10 minutes until golden brown. (Depending on how big you make the cookies, you may need to flatten slightly.) Cool for about a minute on the pan and then transfer to a wire rack and cool completely. Match up cookies in pairs and pipe on filling. In a double boiler (I set my stainless steel mixing bowl over a small saucepan) combine egg whites, sugar and cream of tartar and heat over simmering water. Whisk almost constantly, heating to 160 degrees. Transfer mix to mixing bowl and beat on high speed (with whisk attachment if you are using a stand mixer) until egg whites hold stiff peaks. Add vanilla and mix until just incorporated. Transfer to a piping bag and pipe onto half the cookies (a small offset spatula will also work if you prefer), leaving about 1/4 - 1/2 inch around the edges. 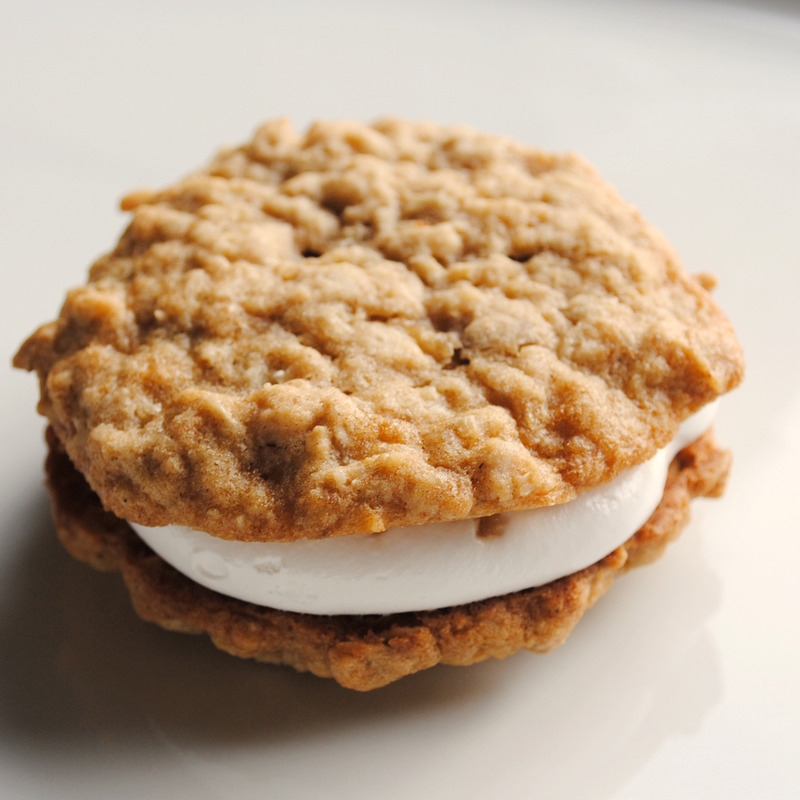 Sandwich with top cookie and press lightly to distribute filling. Store in an airtight container. Looks awesome!! I'm definitely bookmarking the frosting recipe! Thanks! Just made these! They are GREAT! The frosting is awesome!! I loved oatmeal cream pies as kid! I actually tried one a couple months ago and it was not nearly as good as I remembered it. The frosting tasted like sweetened shortening, blech! I'm sure that this recipe is delicious though! If I do not have a kitchen thermometer, is there a way to know when the filling gets to 160 degrees? There isn't really a foolproof way without a thermometer - and since its raw eggs, I'm not sure I would want to chance it. The mixture turns thick and shiny when its about the right temperature. You can get a cheap thermometer for a few dollars at Target, Walmart, etc. though and they really are handy to have around.